The meeting will take place at the Blackstone Valley Visitor’s Center, 175 Main Street, Pawtucket. Beginning at 6:00 PM, representatives from RIDOT, the City of Pawtucket, and the project team, will host an open house to discuss the project and answer questions. 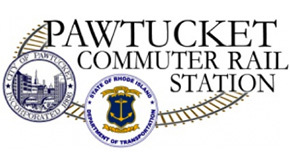 At 6:30 PM, RIDOT will present an overview of the Pawtucket Commuter Rail Project, which is exploring options for a potential station to reintroduce commuter rail service to Pawtucket. The Project will evaluate site, environmental, and rail impacts associated with a new station on the Massachusetts Bay Transportation Authority (MBTA) Providence Line. The Blackstone Valley Visitor’s Center is located at RIPTA’s Pawtucket Transit Center and is accessible to persons with disabilities. Spanish translation services will be available at the meeting. Individuals who do not speak the English or Spanish languages or who are hearing impaired may contact RIDOT on or before June 6, 2013, to request an interpreter. Please direct interpreter requests to customerservice@dot.ri.gov or (401) 222-2450. Si esta información es necesaria en otro idioma, llame al (401) 222-2450. Se esta informacao e nevessario emu ma outro lingua, contate por favor (401) 222-2450. It looks like there’s no plans for anyone from RIPTA to be present at this hearing. Hey, about that whole “better integration between bus and rail” thing… anyone? Anyone? No? It does not make sense to put a station in Pawtucket when there is one just a few minutes away in South Attleboro. It isn’t as though there aren’t enough stops on the Wickford to Boston line already. Tony P: it’s about serving urban customers who right now have no way to get to Boston without first hopping into a car or taking a fairly long bus ride in the opposite direction. Huge, dense area with lots of people in walking distance getting better connection to both PVD and BOS within an existing ROW and existing stop location has great potential for new riders/demand. Also, MBTA to Boston could be made much faster; adding this stop is not a part of the problem. Alon Levy has written several great posts about how to improve this line at: http://pedestrianobservations.wordpress.com/. Tony P: No, there aren’t enough stops on the line between Westerly and Boston. We built two gigantic park-and-rides at great expense to cater to traffic on the line in 2035, but nobody cared enough to focus on the needs of the people who should have been (could have been) served by this line in 2013. I’m not just talking about building more urban infill stations, as Peter Brassard and others have suggested – Davisville Junction would have made for a better park-and-ride, a better gateway to Quonset Point through local bus service, a better opportunity for development in North Kingstown – on the whole, it would have made a better station. Similarly, T.F. Green Airport Station does a fantastic job of serving T.F. Green Airport and invalidates the need to build more garages in Warwick, but for actually serving people in Warwick, Apponaug Four Corners would have been a far better choice – especially given the notoriously horrendous road conditions at the eponymous Four Corners. The Amtrak stations that exist today and have existed for decades in Kingston and Westerly have a sizable ridership base that can be readily tapped for commuter rail, and require only minimal further investment relevant to the sizable amount of money that has been spent and is being spent on both stations today. And to your concern that so many stops is sure to slow a train beyond the point of usefulness, take a look at Metro-North’s New Haven Line – on which every single station between Harlem and Bridgeport is within 3 miles of the next one, and many even less than that. They make it work, and so can we. There’s almost no hope of a fourth track, but you might be able to squeeze in a ~1250 foot siding/turnout on the south side of the existing tracks through the station, and that combined with the third track is likely sufficient especially if building Pawtucket Station means some trains no longer serve South Attleboro. I too support the Pawtucket stop for a number of reasons including the ideas posted above. Also, a stop there opens up Pawtucket, a struggling city, to the valuable Boston market, and there is real potential for transit oriented development in the area nearby that needs help. Restoring our core cities is a big environmental goal. There can also be a market for express service between Providence (and maybe points south) and Pawtucket, a market that Ripta does not serve as their buses between the cities do not use I-95.